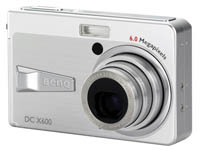 TrustedReviews: If you’re looking for an ultra-compact camera that can deliver good quality pictures with a minimum of fuss, the BenQ DC X600 should certainly be near the top of your list. It is well made, attractively designed, and is one of the smallest and lightest cameras on the market. It has enough options to cope with virtually any shooting conditions, and its excellent low light focusing and flash performance are a big bonus. Considering its very competitive price and the X600 is hard to beat.